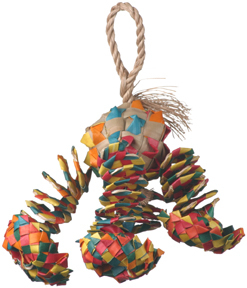 Planet Pleasure's bird toys are made with all natural materials that your bird would find in their natural environment. 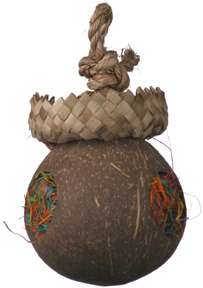 The Coco Forage toy combines weaved palm leaves, coconut fiber, and rope to give your bird all the things they would enjoy chewing in the wild. Toy also includes a hollowed center that can hold snacks and treats. Great for small sized birds.